"I think they're just trying to shut the public up. I want to see the study and see how they did the study." Growing fears over potentially toxic and radioactive ash and smoke from the Woolsey Fire are prompting calls for an independent investigation of the fire and fallout. 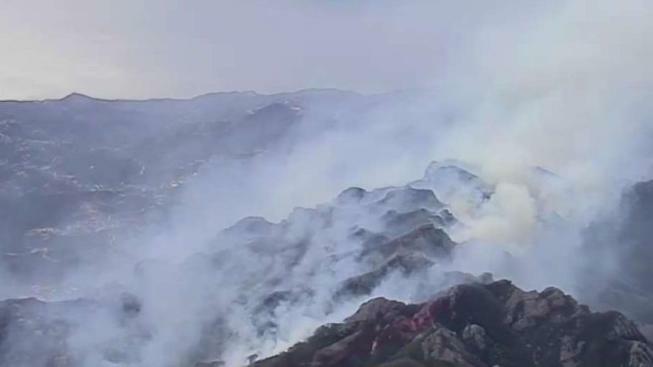 People most concerned live in the West San Fernando Valley, Simi Valley and Oak Park -- neighborhoods within a few miles of the contaminated Santa Susana Field Lab, which went up in flames during the Woolsey Fire. "I'm worried about breathing in all those toxic substances. Long term I'm worried about cancer," Caroline Aslanian told NBC4. She lives in an Oak Park neighborhood near the field lab that's now covered with ash. Aslanian runs an air purifier 24 hours a day in her home to filter out ash and particles, like those clinging to her windows and cars from the fire. Is the Smoke From the Woolsey Fire Toxic? The Woolsey Fire started near the Santa Susana Field Lab, leading to questions about whether the smoke from the fire is toxic. Joel Grover and the I-Team report for NBC4 News at 5 p.m. on Nov. 12, 2018. "I want to limit my exposure to toxic chemicals and radioactive particles from the smoke," she told NBC4. Aslanian and her neighbors are not comforted by a statement issued late Tuesday by the Los Angeles County Public Health Department. The statement says the department "collected air samples and operated multiple radiation detection units" on the burned out Santa Susana Field Lab grounds. "There was no discernible level of radiation in the tested area," the statement said. "I think they're just trying to shut the public up. I want to see the study and see how they did the study," Aslanian said. Also skeptical of the Health Department's claims is Dan Hirsch, former director of the Program on Environmental and Nuclear Policy at the University of California. Hirsch has advocated for a full clean of the contamination at Santa Susana for decades. "The health department's claims are not reassuring," Hirsch told NBC4. He points out that elevated levels of radioactivity have been found at hundreds of locations for years at the Field Lab. "If the quick and dirty measurements the agency is now reporting are not detecting any radiation, they are clearly using devices that are too insensitive to detect it," Hirsch said. He also noted the Public Health Department's statement is "silent about toxic chemical contamination." More than 100 toxic chemicals have been found at the Field Lab, and Hirsch says they could be in the smoke and ash that drifted from the Field Lab to neighborhoods during and after the fire. Hirsch also strongly believes there should be an independent investigation of the fallout from the fire conducted by a university or non-profit group. "Public confidence in regulatory agencies is so shaken that independent analysis is absolutely critical to credibly determine the nature of potential risk from the fire," Hirsch said. "At the request of Supervisor Kathryn Barger, the Los Angeles County Department of Public Health (Public Health) performed an assessment of the Santa Susana Field Laboratory (SSFL) due to nearby wildfire activity burning through portions of the facility. "Public Health officials traveled to the facility and performed nuclide identification, collected air samples, and operated multiple radiation detection units. There was no discernible level of radiation in the tested area. Public Health has discussed with the California Department of Toxic Substances and partner agencies their preliminary findings, and all found no evidence of discernible radiation in areas they tested around the facility. "Although the SSFL is located in Ventura County and is regulated by the California Department of Toxic Substances Control, multiple agencies took measurements of radiation and hazards compounds including the 9th Civil Support Team, the Department of Energy Radiological Assistance Program, and California Department of Toxic Substances Control. Results reported from the agencies concur with Public Health’s assessment. "Public Health will continue to work with partner agencies to monitor the facility and respond to the fire event. For health information, visit www.publichealth.lacounty.gov."